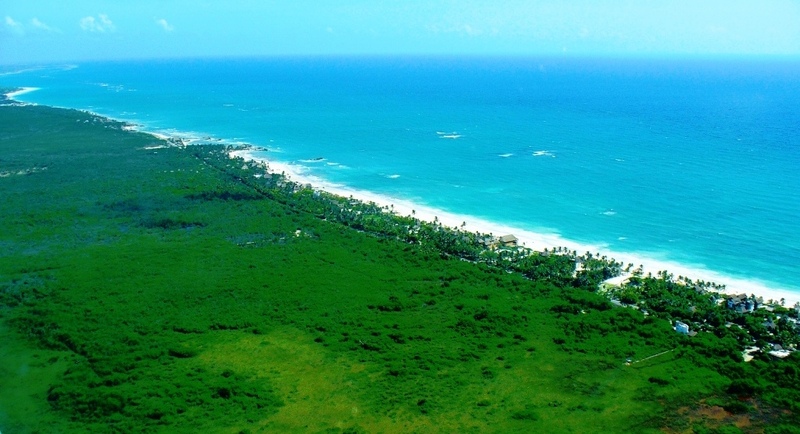 Tankah Bay is situated just north of Tulum and Tulum Ruins. The bay has a wide protected beach with an outer reef break to knock down most of the surf. There’s great snorkeling and kayaking out in the bay. The beach is narrow in parts, wider in others, with mostly fine sand just off the surf line. There’s plenty of room to sunbathe but foot protection is recommended in the water. The Bay is flanked by many naerby attractions including great places to dive and snorkel on the jungle side opposite the ocean. Manatee Cenote is on of these great snorkeling sposts. The cenote is actually a river of clear water which has carved its way through a beautiful green mangrove on its way to the sea. The water empties into the bay through a submerged cave. Also, some spectacular birds can sometimes be spotted up in the mangrove to birdwatchers delight and its common to see pelicans soar in formation along the beach. For snorkelers, there are plenty of fish to see in both the cenote and out on the reef. There are some fine hotel room accommodations on the bay as well as private villas. This is a tranquil laid back place with two great restaurants; one at Casa Cenote and the other next door at Blue Sky hotel. Both restaurants are a stone’s throw from Manatee cenote. Tankah Inn also provides great morning meals at reasonable rates with incredible sights of the bay from it’s second floor restaurtant and terrace. The Inn also lets you hook up to their wireless internet for almost nothing. The Bay is Just a few kilometers south of Bahia Soliman. Paraiso Tankah is on the long point that juts out into to sea separating the two in-cut bays of Soliman and Tankah. Tankah Bay, also known as Tankah Tres is an exceptionally large bay with an outer reef break to reduce the surf. Great kayaking here! And it is the home of the “Casa Cenote” restaurant, a local favorite for a cold one and a cheeseburger in paradise. Manatee cenote is a must see on Tankah Bay; a natural ribbon of emerald water that winds its way through the mangrove toward the sea. This is a good alternate snorkeling spot that also serves as a hunting grounds for any number of migratory birds like snowy egrets, ibis and herons. All the rental homes on Tankah Bay and in Paraiso Tankah run on pole power from the local utility. Many have swimming pools, air conditioning and deluxe interiors, and all open to the beach. Paraiso Tankah is on the north end of the access road, just beyond the north point of Tankah Bay. If you love to see the raw power of the Caribbean Paraiso Tankah is a perfect spot to do it, and Tankah bay is just a couple minutes away.. The pueblo of Tulum and the Mayan ruins are 10 minutes away to the south with Akumal roughly 15 minutes to the north. Both Tulum and the Akumal area have telephones, money exchange, shopping and other restaurants. Tulum also has a major bus terminal. Besides lounging in a hammock you can walk the beach, sunbathe, bird watch, some homes have sea kayaks, there’s diving, gazing at the stars, or just do nothing at all! The location is also convenient to numerous day trip adventures along the coast like the Riviera Maya’s cenote freshwater pools, Actun Chen cave, various eco-parks & attractions, Yal-ku lagoon in Akumal, numerous beaches and of course Mayan ruins. So what would you like to do? Tankah Bay is between Akumal and Tulum in the “Riviera Maya” Mexico and are convenient to Playa del Carmen, Valladolid, Chichen Itza and all destinations listed on LocoGringo.com.